Where will the freedom of driving take you? Learning to drive for the first time is a really exciting prospect for anyone, young or old. However there are a couple of things that you must ensure are in proper order before you can begin that you might not of thought about. These pages will act as your guide to getting started on this wonderful experience. Your provisional license is a requirement before you can even start driving lessons. You can apply online for your license by clicking here. For those who are very keen, you can apply for your provisional driving license up to three months before your 17th birthday. Please keep in mind, the license will not be valid until your 17th birthday and you will not be able to take lessons till then. Don't forget to bring your provisional license to your first lesson. It will need to be seen to verify your identity and to ensure you hold a valid license. If you do forget it, you will not be able to get behind the wheel. All requirements for applying online or by post are above. Sometime during your first lesson, be it with us or another driving school, a simple eye sight check should be performed. This will also happen at the start of your actual driving test as well. It's really nothing to worry about. It simply involves you reading back a number plate of a parked vehicle that's 20 metres away. If you normally need to wear glasses or contact lenses then you must wear them every time you drive unless you are legal without them. Please see the above link for the absolute specifics on the rules. There are certain medical conditions that may prevent you from driving, or at least require a doctors certificate to ensure you are fit to drive. An outline of some of these is listed below although the DVLA should be consulted for a full list. These items are covered on the application for a provisions license. Once you've got your provisional and dealt with any other requirements, it's finally time to pick who to learn with and decide what style of tuition bests suit you. Unlike the sea of other driving schools, we here at Adsom take a personal approach. With the majority of driving schools you'll never know who you'll be learning with; infact you'll know nothing about your instructor other then their name. 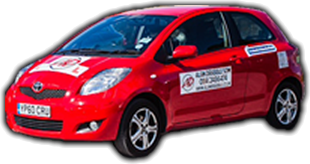 As an intentionally small driving school, we have the luxury of displaying each of our instructors personally, so you can get to know them before being in a car with them for several hours a week. The great thing about this is you'll be building a repor with them from the get go; no call centres here! Check out our Who we Are page and get to know our instructors. Here at Adsom, we also offer intensive/semi-intensive courses to help learners get to test standard and pass QUICKER in Sheffield. This doesn’t mean that there are any short cuts to passing, merely that by having lessons in a more concentrated form you as a learner forget less between lessons. With us, learners on intensive driving courses benefit from bigger discounts for block bookings, gain confidence quicker, and we have found that individuals are more successful on test when they have built up with lessons being closer together. We would first advise an assessment lesson so we can advise you on the type of training course that will be best suited to YOU.